I was having a really great conversation last week with my new friend over at HubSpot, Kipp Bodnar (author of The B2B Social Media Book). He asked me where I thought PR fit into the marketing funnel. It seems pretty straight forward, right? 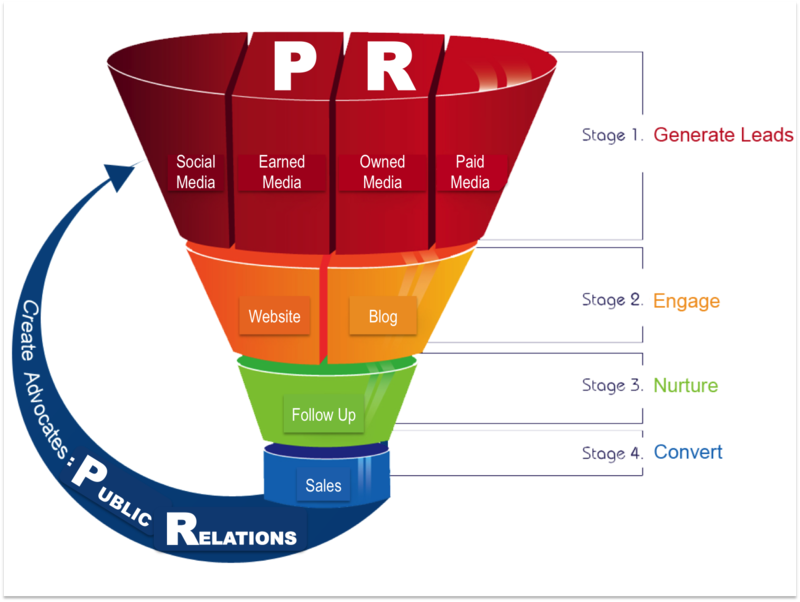 PR helps you increase awareness, or GET FOUND (see Inbound PR infographic), by generating leads through earned media (press hits, analyst reports…), owned media (website/blog content…) and social media (Twitter, LinkedIn…); and therefore, PR comes in at the TOP of the funnel. Well, the reality is this analysis only scratches the surface (pun intended). PR also comes in at the very bottom of the funnel — after sales. At the bottom, the goal of an Inbound PR pro is to “convert” sales into genuine advocates. Those success stories, testimonials and case studies will then get dropped right back into the top of the funnel so your company can get found by those prospects just waiting for this kind of validation. It’s a virtuous cycle! A top-down and a bottom-up approach, a good PR program will ensure all your press, analysts, leads, partners and investors, hear about how you are changing people’s lives for the better — because at the end of the day, that’s what they most care about. Pingback: Where does PR fit into the marketing funnel?